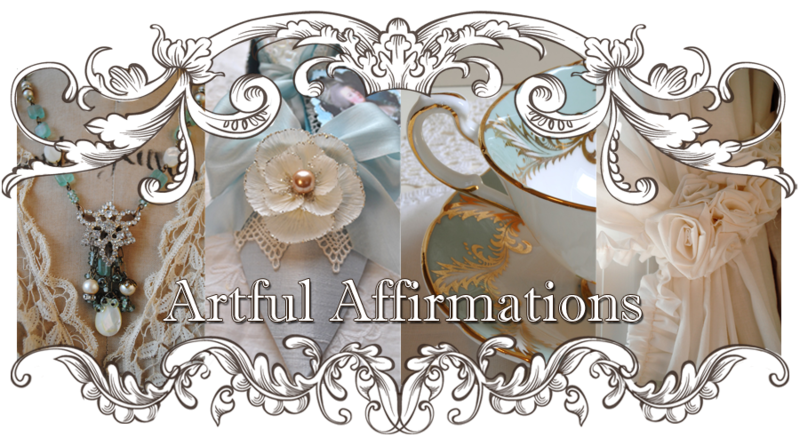 Artful Affirmations: Tea Cup Tuesday-Irish! 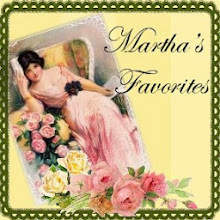 Welcome to Tea Cup Tuesday with Martha and myself. 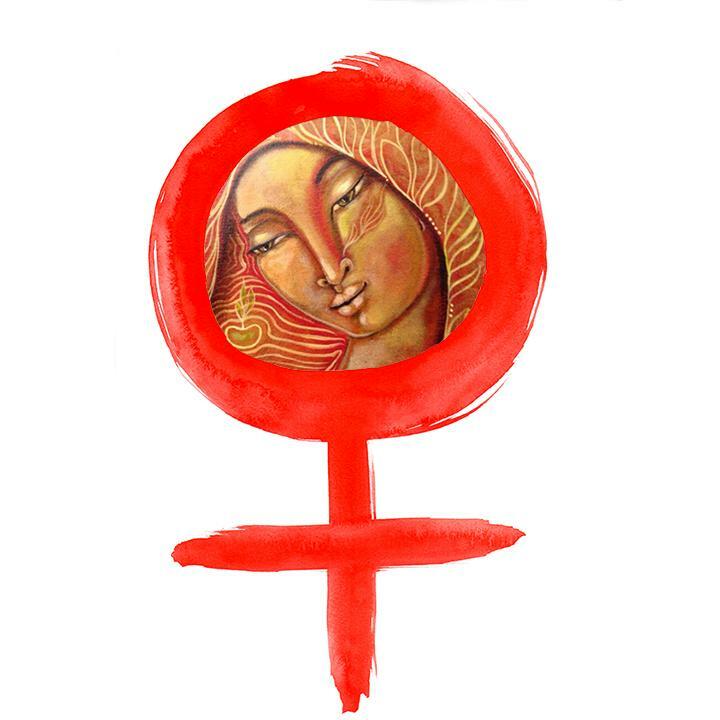 I missed seeing you all last week as I was away on a much needed retreat! My last post announcing the winners of my Milestones Giveaway also tells some of my trip. But for now, on to tea cups! St. Patrick's Day is just around the corner. 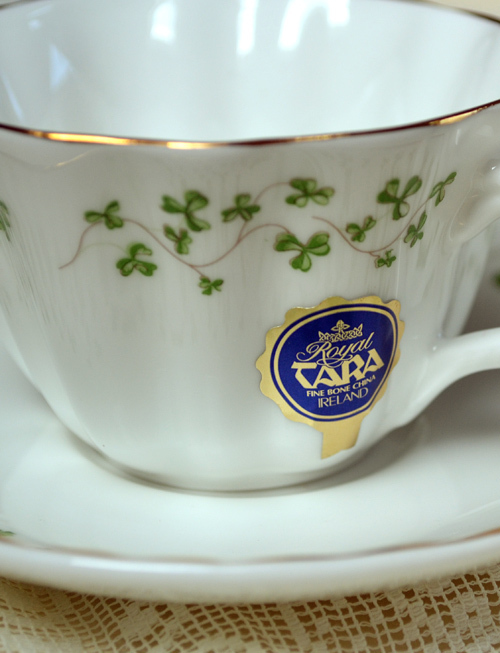 You don't need to be in order to enjoy an Irish cup! I have never had a clover cup, but decided I need all the luck I can get! What a sweet spring cup this one is! This cup still has the maker foil sticker on it. Remember years ago, you were supposed to leave that sticker on? Or was it only us up in Canada who did that??? Royal Tara is a company I am not familiar with. 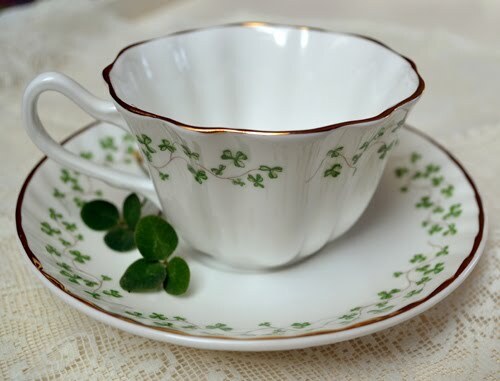 So I was delighted to find this clover tea cup at a nearby antique center. 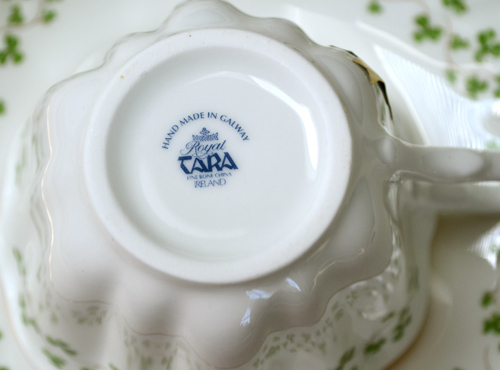 This Irish company has been creating fine china for 50 years in Galway, Eire. I was unable to find backstamps so I do not know the age. It does not look old at all. Do any of you have Royal Tara in your collection? 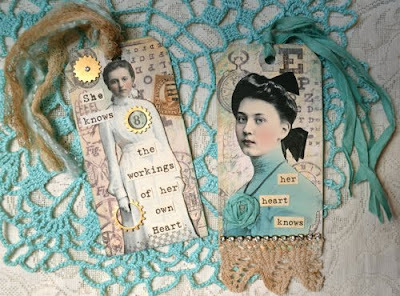 Here are two tags that I have just finished. 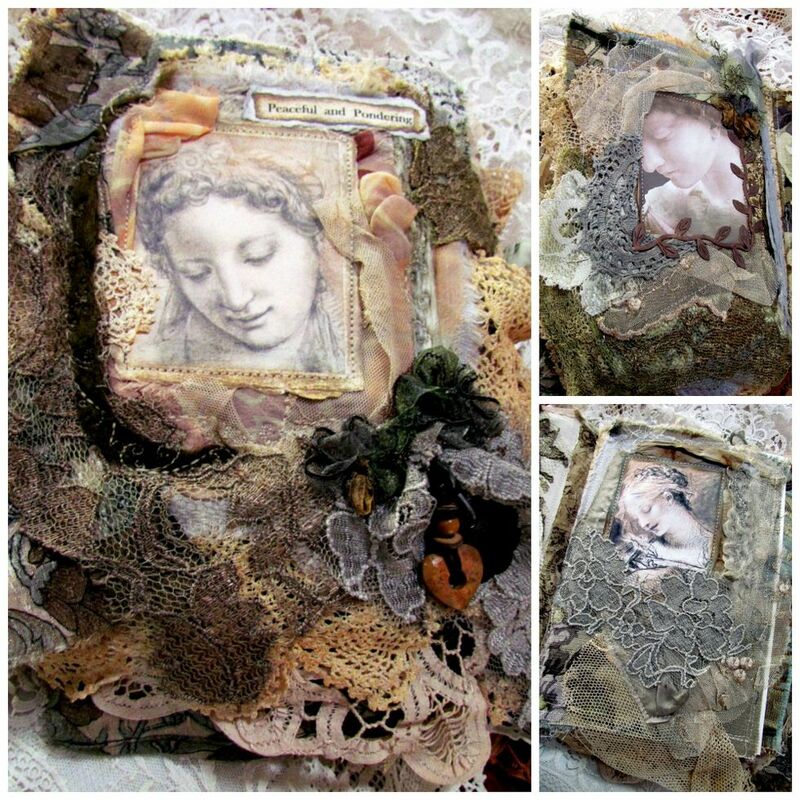 I really enjoyed the background process, of gesso, paint dabbers, stamping script and other Tim Holtz stamps, and then sanding it all down! I love the sanding! 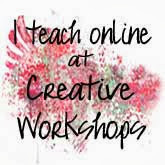 If you would like to join in Tea Cup Tuesday just create a post with your tea cup in it and then come back here and sign up with Linky Tools below. Then we can come and visit you and see your beautiful china too! Yay! Your tags are so lovely. 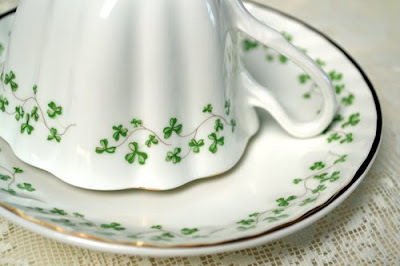 I love how you used shamrocks with your teacup vignettes. So pretty, and your china set is gorgeous. 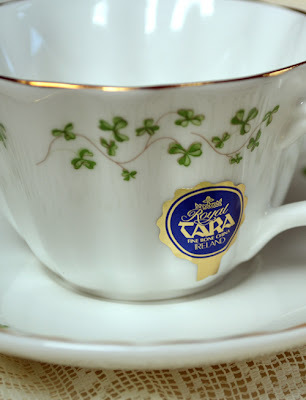 Love your Tara teacup, I have one I just posted too. Thank you for hosting such a wonderful party! Gorgeous teacup Terri, and your tags are divine! 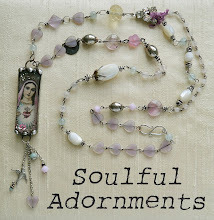 I enjoyed seeing your pics from Art ans Soul...so glad you had a great time! Your tags are so charming as is your Irish tea cup and saucer!! Gorgeous tags Terri...beautiful!! and lovely tea cup..so enchanting! Have tried to get pieces of Tara on eBay, the prices always seem to go to high!! 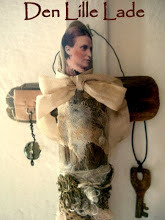 Thanks for reminding me that I need to pull out my Belleek for St. Patty's day!!!! Drop by for tea, if you get a chance! What a pretty teacup Terri! Love it for this time of year. Your tags are very cute also. Thank you for hosting! Welcome back! We missed you last week! What a wonderful find! The design of your Tara cup is just darling; love the crimping! 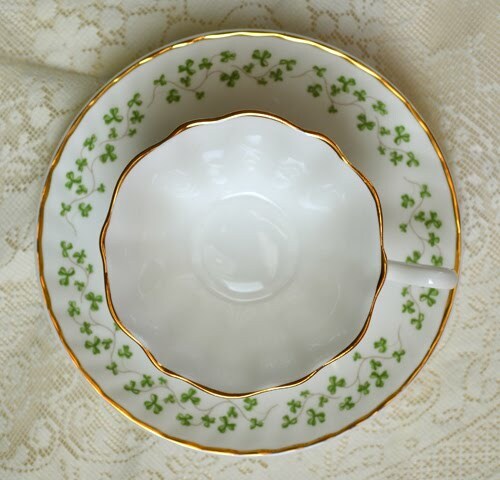 It is such a dainty looking cup; a real sweetheart! Your tags are really pretty too. Thanks for sharing and enjoy your week. Hi Terri.....maybe it was the fact that you emailed me last night...but I remembered that today was Tuesday and I made a point of joining in on all the TEA fun! I tried to link up to you....on the list here...but for some reason it isn't coming up at all....so I tried again....and still nothing! I don't know what's the matter...but I'll try again after a bit if I notice it's still not showing up. Okay! WAtch it will show up twice and I'll clutter up your list on you......sorry.....? Hope you'll come by and read about where my TEA cup passion began...I've posted some nostalgia today! I love your tags! How creative! Sounds like you are having a wonderful time. I don't have any Tara but they make lovely items. 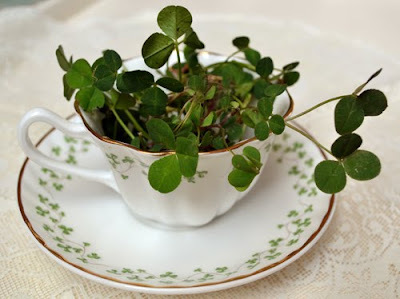 Your shamrock teacup is lovely! Beautiful, beautiful cup--just in time for St. Paddy's day! I love your tags, also! you picked the sweetest clover design, I ever saw. Delightful shape and cute design. We had thosestickers on everything, crystal, china and other items. Hard to remove but they become ugly after using a while. Sometimes they are only on the backside. Your cup looks really brandnew with that sticker. Your tags are beautiful and very romantic. Thanks for sharing. such a nice cup!! 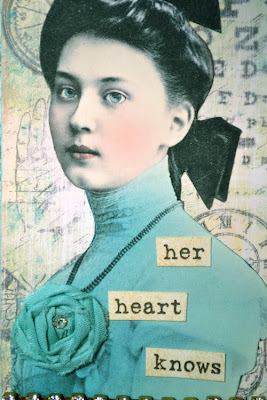 And I love, just LOVE the tags!! I really enjoyed this post. All your posts make me want to collect tea cups! Oh - such a beautiful cup! 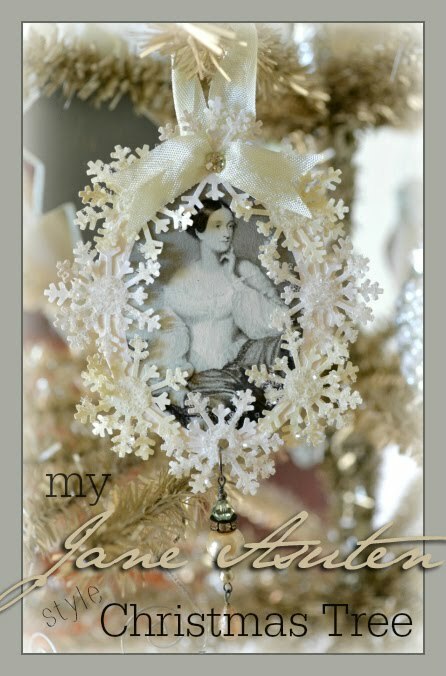 The shape reminds me of my lily of the valley cup I featured a couple weeks ago. I really like the delicate and detailed shamrocks, too! But totally LOVE your tags! 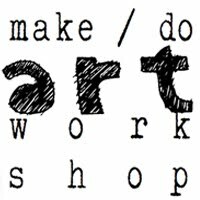 I really need to take a day and just tutorial myself out on these techniques - want to gesso before the year is out! Terri, the teacup is so sweet - and your tags are absolutely gorgeous.... I love them! I love looking at the cups, Terri. They are beautiful! I will be back soon. Hi Terri, I really love the Irish tea cup it is so beautiful, and I loved the decoration of the shamrocks! Have a great day today!! Love you. Oh no, I was taught to leave the sticker on, too. Still do that :) Sure is a pain when it comes time to cleaning it an avoiding getting the sticker wet! Lovely cup! That is just such a beautiful teacup set Terri! Happy St. Patrick's Day to you. Thank you for hosting and have a wonderful week. I also love your beautiful tags! such pretty colors and great PW images. Everything looks so lovely. Your tags and Tara teacup are beautiful. Thanks for sharing. Have a wonderful evening. Thanks for visiting Magnolia Cottage. That is a great St. Patrick's Day cup. It's darling with those tiny clovers. Your tags are gorgeous! That is a beautiful cup! I love your tags. They are so original and feminine!